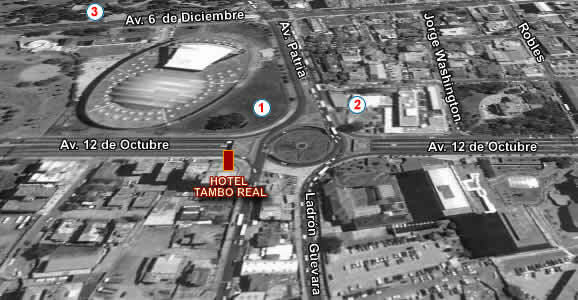 Tambo Real Hotel is strategically located in the heart of Quito, in the commercial tourist and banking area, just 15 minutes from the airport, near Amazonas Avenue, one of the most attractive ways of shopping and fun ride. The colonial center of town is only five minutes from the hotel, there will appreciate the most beautiful churches and various historical and tourist sites. The hotel has 90 comfortable rooms distributed as follows: executive suites, junior executive, standard rooms and single, double, triple and quadruple. including minibar, safe, cable TV, phone system with national and international calls, and a variety of amenities that will make your stay in the city of Quito is an unforgettable experience.